I’m planning to do one more post with some final quotes and comments from the end of the Food Revolution Summit, but wanted to take a quick break to share the amazing drink I made today. It’s one of the easiest things I’ve ever made, and was totally incredible! I LOVE grapefruit juice…. especially fresh squeezed. It takes minutes to make the juice and clean up, and about 30 seconds to drink :-). 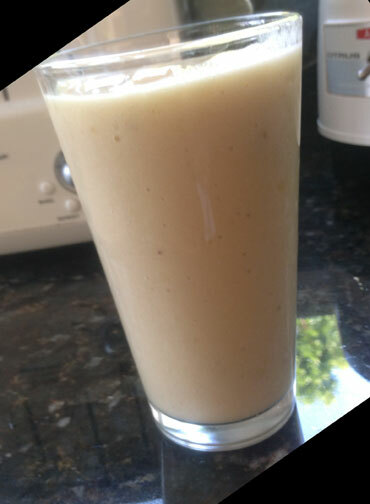 I started thinking of different ways to use it that might make it last a little bit longer….. a smoothie didn’t seem quite right, and then I realized that the perfect complement would be something sweet – a sweet-tart drink! I pretty much always have frozen bananas on hand, and happened to have some frozen pineapple as well, and these 3 ingredients were all it took…. Into the blender went 1 frozen banana, about 1/2 cup of frozen very sweet pineapple, the juice of 1 grapefruit, and a little water to help it blend a little better… and it was GREAT! The perfect mix of sweet and tart, all from whole unprocessed ingredients. This will be the perfect drink for those hot summer days to come…..